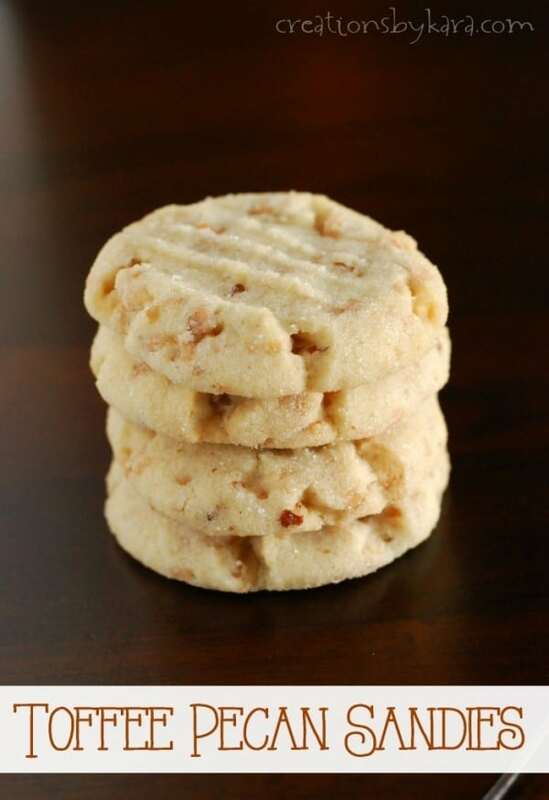 Pecan Sandies with Toffee- melt in your mouth cookies loaded with crunchy pecans and toffee bits. So much tastier than the store bought version! If you love trying your hand at making homemade versions of popular cookies, try my Homemade Oreos and Roll & Press Sugar Cookies. You’ll love them! Do you like your cookies crispy or soft and chewy? I am a soft and chewy cookie kinda girl. Aside from shortbread, there are not many crunchy cookies that I love. 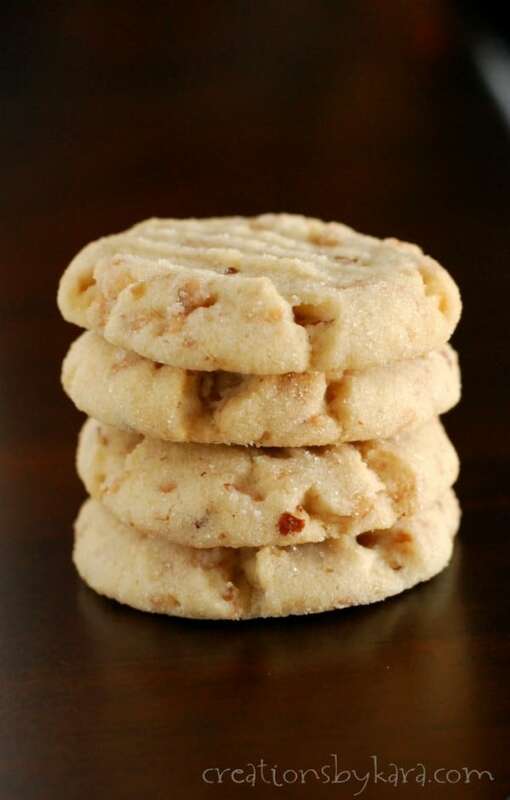 But I am adding these Toffee Pecan Sandies to the list of crisp cookies that I could eat way too many of. They have a crumbly texture, which I’m guessing is why they are referred to as “sandies”. And they do just melt away in your mouth. I have actually made the recipe before, but this time I added toffee bits. And oh my gosh was that a great addition! I love the depth of flavor they add, and the extra crunch. 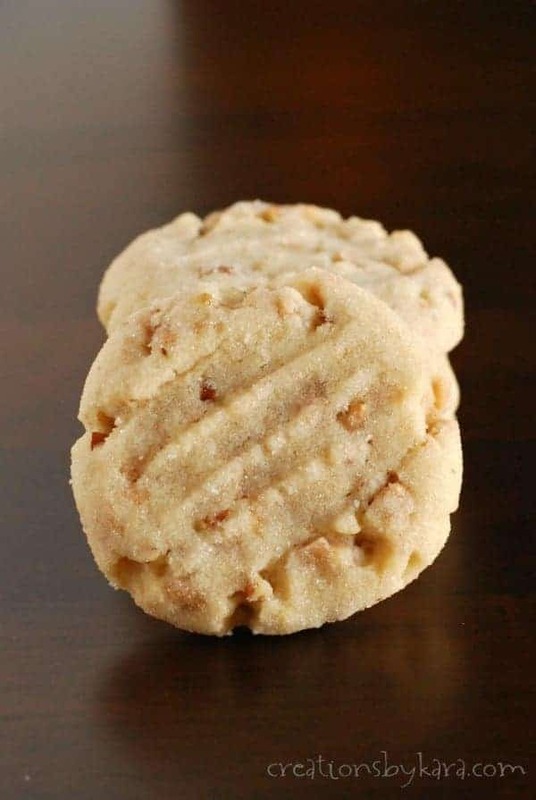 If all you have ever tried are store bought Pecan Sandies, you should really give this recipe a try. You are in for a real treat! Cream together butter, sugar, and powdered sugar in a large mixing bowl. Beat in the oil, eggs, and almond extract. Stir in the all purpose flour, wheat flour, baking soda, cream of tartar, and salt. Roll the dough into balls. I like to use a cookie scoop to make sure all my cookies are the same size so they bake evenly. Place about a half cup of sugar in a bowl. Roll the cookie dough balls in the sugar, then place them on cookie sheets that are greased or lined with silicone pan liners. 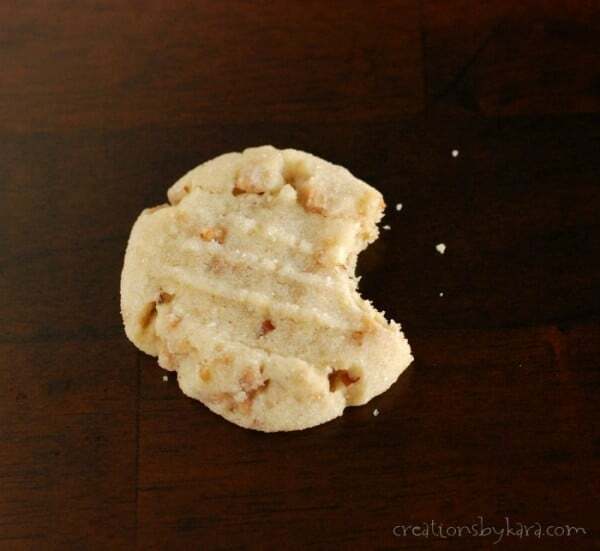 Flatten each cookie with a fork. Bake the cookies at 350° for about 12 -14 minutes depending on size. Cool on cooling racks. Why does the recipe call for butter and oil? A mixture of both gives the cookies the perfect texture. You don’t want them to be chewy, they should practically melt in your mouth. Do I have to use both powdered and granulated sugar in my pecan sandies? The powdered sugar has a bit of cornstarch in it, and the powdery texture contributes to the crumbly texture of the cookies. Can I use vanilla instead of almond extract? I love the almond extract, but you can use vanilla if you prefer. Can I use all regular flour instead of part whole wheat? Yes, you can, but they won’t be the same. The whole wheat flour adds a nutty flavor, as well as giving the pecan sandies the “sandies” texture. I don’t have cream of tartar, what can I use instead? You can substitute 2 tsp of baking powder in place of the baking soda and cream of tartar. It won’t be quite the same, but it will do in a pinch. Cream butter and sugars in a large mixing bowl. Beat in oil, eggs, and almond extract. Stir in the flours, soda, cream of tartar, and salt. Add the pecans and toffee bits and stir till just combined. Roll in balls, then roll in sugar. Place on lightly greased or silpat lined cookie sheets. Flatten with a fork. Bake at 350° for about 12-14 minutes. See all my cookie recipes HERE. Baking soda or club soda? Also wondering, baking soda or club soda. It’s baking soda. I’ve updated the recipe, so sorry for the confusion. These look so, so yummy! I have made shortbread cookies many times but never sandies—I am sure you are right. These must be so much better then store bought. 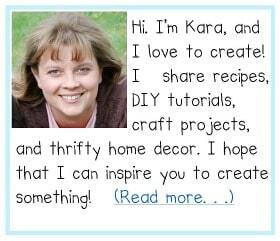 pinned to try (hopefully soon, tee-hee:) Have a great week.